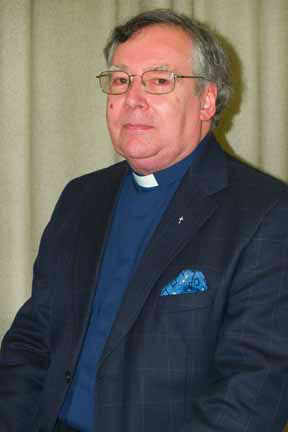 Rev Howard Ketton became our Pastor in October 2004 after a year long interregnum overseen by our Moderator Rev Derrick Tickner. During his Pastorate the fellowship has grown with several baptisms each year increasing Church membership. A monthly Luncheon Club was reinstated taking place on the 3rd Thursday of each month. The donations towards the meal paid for speakers and also the replacement of several items of equipment in the kitchen. A Banner Group was created in 2005 and over the years has produced many banners for various times of the year and in 2011 the project was to produce a huge banner involving everyone in the church. It took 3 years to complete and was unveiled in 2014 and hangs on the back wall of the church. Church Holidays were restarted with visits to the Lake District (2006), Weymouth (2007), Tenby (2008), Northumberland (2009), Norfolk (2010), Minehead (2011), and Bournemouth (2012). A class set of new Bibles were presented in 2007 to Newcroft Primary School after it was found out that their Bibles had become old and worn out with use. In 2009 Passion Youth Work in Shepshed was created, supported by the Churches Together in Shepshed and it has been a great success and grown over the years, giving the young people of Shepshed a safe place to meet. An annual concert of 'Songs from the Shows' has been held at St Botolph's since to raise funds which has been really well supported by CTIS and the folk of Shepshed. Howard has led our choir since he became our Pastor and we have enjoyed their performances in church services and other occasions. 2010 was also the year the Joshua Project started. Following a sermon about the Battle of Jericho one Sunday morning, a group decided to walk around the outskirts of Shepshed praying for the souls of the inhabitants. This was repeated in 2011 and again in 2016. Centenary celebrations were held in September 2011 of the refurbishment of the chapel in 1911. The Minister and Diaconate dressed up in period costume for the occasion and the first half of the service was held as it would have been in 1911 before changing to the modern style for the second half. Many changes have been made to the church building starting with the removal of the wall to the choir vestry making a pleasant coffee area for meeting each other after the services. The kitchen was reordered with new cooker and re-floored. The upper hall has been completely renovated with the removal of the stage and recarpeted. New lighting, blinds, and new toilets have been installed and a kitchen area created so food and drinks can be served at events and the whole redecorated. A lift has been installed which is a great help for the elderly and also for moving equipment from the church up to the hall for events. By taking some of the lounge to make a new room we now have somewhere to interview folk seeking advice from FreeDA, a debt advisory service based in the church. Over the years there have been many social occasions in the church including walks, a picnic on the Beacon, Hathern Band Concerts, an Oriental Evening following a course led by one of the fellowship, quiz evenings and day trips out. Social groups have been formed too - Men's Group (monthly) which has now merged with the Men's Breakfast, Women Together (Monthly) and the One Club for people who live on their own (fortnightly). These groups and events have helped bring people together and deepened our care and support for each other in the church. Pastor Howard Ketton and Hilary retired in Oct 2016 having completed 12 years of working tirelessly to support the fellowship here at Charnwood Road BC. On 1st September, after a 2 year interregnum, our new Minister, Rev Nigel Riley, was inducted to the pastorate of our church.